I note with some humor the recent outburst by American politicians when it was revealed that the Ralph Lauren uniforms that will be donned by US Summer Olympic athletes were manufactured in China. Never mind that the US Olympic Committee is a private organization that relies heavily on private donations. 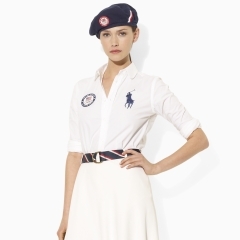 Never mind that Ralph Lauren is a huge contributor to the US Olympic Committee and that Ralph Lauren won the bid to supply the uniforms. Senator Kirsten Gillibrand, D-NY wrote: “There is no compelling reason why all of the uniforms cannot be made here on U.S. soil at the same price, at better quality.” With all due respect, Senator, there are many compelling reasons. Back in the early 1980’s I took a sabbatical leave and lived for a short time in South Carolina, where the textile industry was a major employer. Textile manufacturing was migrating to Asia in a large way back then, and the trend has continued. Likewise, American apparel manufacturing jobs have largely been replaced by foreign firms. Shirts, coats, gloves, pants, and other apparel items require labor-intensive manufacturing methods. Ultimately, someone is bent over at a sewing machine assembling garments. Mankind has not yet designed a machine that can cut, sew, press, and package a garment. Countries with low wages and substandard working conditions have a comparative cost advantage over labor in highly regulated, high wage countries like the United States. A few years ago I was helping my wife sell some handsome sweatshirts at a local event. An older gentleman was admiringly gazing at the sweatshirts but when he looked at the shirt label, he backed away as if he had been shocked by a charge of static electricity. He told me that he was no longer interested in the sweatshirt because it had been made in China. “I’ll start buying their stuff when they start buying our stuff,” he said. I then told him that I had flown into Beijing the week before and saw at least 30 Air China Boeing 747 (US Made) jets sitting at the terminal. Each of these jets costs about $350,000,000. “That’s a lot of sweatshirts” I told the man. The fact is that we in the United States have a cost advantage in designing and producing complex, technically sophisticated products that sell for high prices. Many Chinese workers produce labor-intensive, low priced products such as the blazers and slacks made for the US Olympic athletes. This is as it should be; each country specializing in the products in which it has a comparative advantage. When the countries trade their products, workers and consumers in both countries benefit. Senate Majority Leader Harry Reid said this week that “they should take all the uniforms, put them in a big pile and burn them and start all over again.” Harry, If you’re serious about bringing “sewing machine” jobs back to the U.S. why don’t you put heavy tariffs on all foreign garments and mandate a $25 per hour wage for American garment workers, along with health insurance, a fat pension, and other fringe benefits? Then American consumers would be forced to pay $85 instead of $20 for a shirt. This would lead to a decline in the standard of living of Chinese workers and American consumers alike. Like most politicians Harry is “weak” on economics. Actually, Harry, I’ve got another idea. Maybe you should shut up, concentrate on shrinking the size of a bloated Federal Government, and let a fine US company (Ralph Lauren) continue to take care of our Olympic team. An aside: I’ve been buying polo shirts off of eBay, and it’s incredible the premium buyers will pay for the Ralph Lauren polo pony logo. It adds an extra $20 to the price of a $10 shirt. Now this just makes economical sense for clothing. But what about all the other “stuff” that comes out of China? I try to buy local/USA as often as possible, even fruit/veggies (from Mexico). Actually, Carol, it makes sense for virtually everything that can be made or grown. Let’s take garden hose. The Chinese can make a good quality 50 foot hose that sells at Wal-Mart or Menards for $25. Menards is buying it from the Chinese for $15. If that same hose was made in Toledo it would cost Menards $30 and they would mark it up to $50. It is tempting to think that we could bring these jobs back to America and still pay Wal-Mart prices, but we can’t have it both ways. The total benefits of cost saving of $25 per hose, times the millions of Americans that buy the hose far exceed the entire output of a US hose factory.